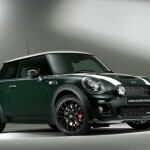 Mini has unveiled a special edition Cooper S model in Britain. 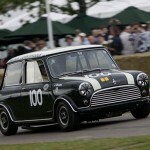 The Mini John Cooper Works World Championship 50 is supposed to celebrate the birth of Mini and John Cooper’s Formula One title victory 50 years ago at around the same time. In 1959, Alec Issigonis presented his concept for a small car which, with its transverse-mounted front four-cylinder engine and space for four occupants plus luggage. 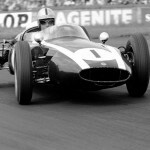 That same year, sports car constructor John Cooper won his first Formula One World Championship title with Jack Brabham at the wheel. 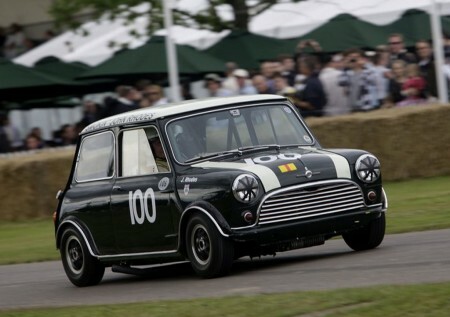 50 years on, the MINI John Cooper Works World Championship 50 evokes both the start of the triumphal path of the classic Mini as well as victory in the F1 Drivers’ and Constructors’ Championship for John Cooper’s racing team. 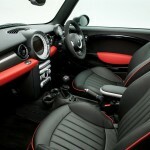 This MINI special edition was inspired by John Cooper’s son, Mike. His signature appears on the facia and on one of the bonnet stripes. It will have a limited production run of 250 units and was unveiled to the public at the 2009 MINI United Festival in Silverstone. The car is based on the Mini Cooper S JCW, and features numerous exterior and interior details reflecting the racing pedigree of the brand. 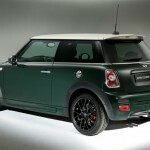 The bodywork of the Mini John Cooper Works World Championship 50 comes in a new Connaught Green, harking back to the famous color of British race cars of the 1950s and 60s era. It is combined with the roof and bonnet stripes in Pepper White. The green with the white bonnet stripes mirror the color concept of the Cooper F1 cars. The specification of these colors was provided by Mike Cooper giving the car its authenticity. Mike was consulted throughout the development by the MINI Design department. Mike’s full name is “John” Michael Cooper and he signs himself John Cooper. His signature appears on one bonnet stripe and on a fascia plaque. Further accentuating the competitive character of the special edition are the John Cooper Works aerodynamics package and John Cooper Works Cross Spoke CHALLENGE light-alloy wheels in Jet Black. Ensuring both an optimal view and a striking look are HID headlights with black interior surfaces and additional driving lights with black housings. The MINI John Cooper Works World Championship 50 also features a plethora of carbon-fiber features, among them the bonnet scoop on the bonnet, rear diffuser, exterior mirror caps and tailgate handle. These provide the link to the modern racing era. 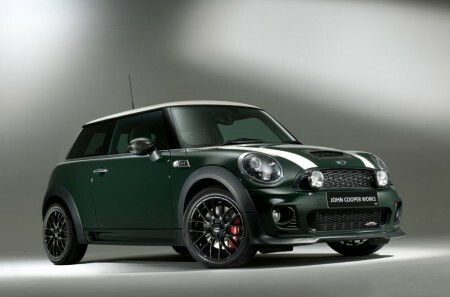 Special numbering on the side scuttles finishers identifies each MINI John Cooper Works World Championship 50 as an individual entity of an exclusive limited series. Regarding the interior color and trim, the racing theme is maintained by Carbon Black overlaid by subtle sporty red touches. 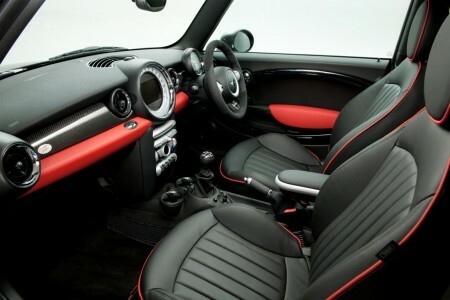 The full leather sports seats come in black with red piping and the red theme is perpetuated with coordinating red knee-rolls, armrests and red stitching on the floor mats, gearshift & handbrake gaiters. Fascia, and door grip finishers continue the carbon-fiber theme, as does the John Cooper Works insert on the Sports Steering Wheel with an Alcantara rim. Like the design features of the MINI John Cooper Works World Championship 50, the power source under its bonnet is similarly defined by the racing competence of MINI John Cooper Works. This 1.6L four-cylinder unit is based on the engine of the Mini John Cooper Works CHALLENGE that was first fielded in the 2008 MINI CHALLENGE. It provides 211 hp and develops maximum torque of 192 lb-ft between 1850 and 5600 rpm, which can even be briefly increased to 206 lb-ft thanks to an overboost feature. Power transmission is via a six-speed manual gearbox. All this enables the Mini John Cooper Works World Championship 50 to do the 0-60 mph acceleration run in 6.3 seconds, going on to a top speed of 149 mph. Also key to the superior performance of the Mini John Cooper Works World Championship 50 is its suspension technology, which is unique for this vehicle class. In addition to the McPherson struts on the front axle and a central-arm rear axle otherwise not found in the small car segment, electromechanical power steering (EPS) also helps guarantee safe and thrillingly precise handling. A Sport button on the center console activates a palpably more dynamic setting with sharper steering response and enhanced precision. In keeping with this, the Sport button also switches the accelerator pedal control map to an even sportier mode. The large sports brake system with red aluminum calipers guarantees short stopping distances. It responds with precision and brake power can be finely applied. 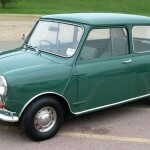 As a close friend and business partner of Mini creator Alec Issigonis, John Cooper paved the way for, and gave his name to, these Mini variants that were to prove so successful in the sporting arena. The man who recognized the competitive potential of the Mini early on and then systematically capitalized on it had previously already created a revolution on the world’s race tracks. He was the first constructor, along with his father Charles Cooper, to field a mid-engined sports car in the Formula One World Championship. In doing so, the team set a trailblazing trend for the entire motor sport sector. In 1959 and 1960, Cooper race cars scooped up the Constructors’ and Drivers’ title in the Formula One World Championship – a first in racing history for mid-engined models. It was a concept that caught on, as to this day, all Formula One cars are built according to this principle. 50 years on, the legendary British race track at Silverstone provided the perfect backdrop for the world premiere of the MINI John Cooper Works World Championship 50. From 22 to 24 May 2009, MINI fans from around the world celebrated the 50th anniversary of the brand at the MINI United Festival. They gathered together to enjoy an exciting program of live performances by top stars from the international music scene, lifestyle action in typical MINI style, and countless intriguing glimpses of the brand heritage. Silverstone also hosted two rounds of the current German MINI CHALLENGE.